Located at 1700 North Elm Street, just opposite the primary entrance to the prestigious Irving Park Neighborhood in Greensboro, N.C. Throughout their history, the apartments have been home to some of Greensboro’s prominent citizens. These buildings were designed in the International Style by noted architect Charles C. Hartmann and were constructed in 1938. 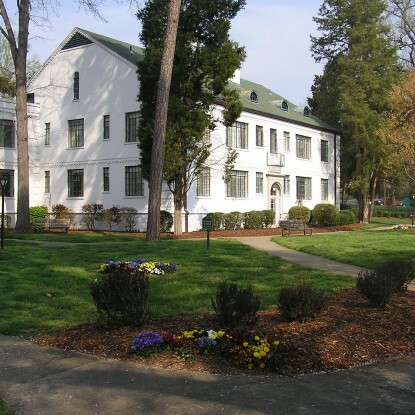 Hartmann’s design for The Country Club Apartments incorporated two story structures in a horseshoe pattern encircling a 4.7 acre courtyard lawn featuring various large hardwoods. The complex consists of three separate buildings, housing eighty-six apartments designed in thirteen different floor plans ranging from the studio style to two bedroom units. Since June 2007, the developer has conveyed 71 of the 86 units to homeowners, while retaining 15 for lease.